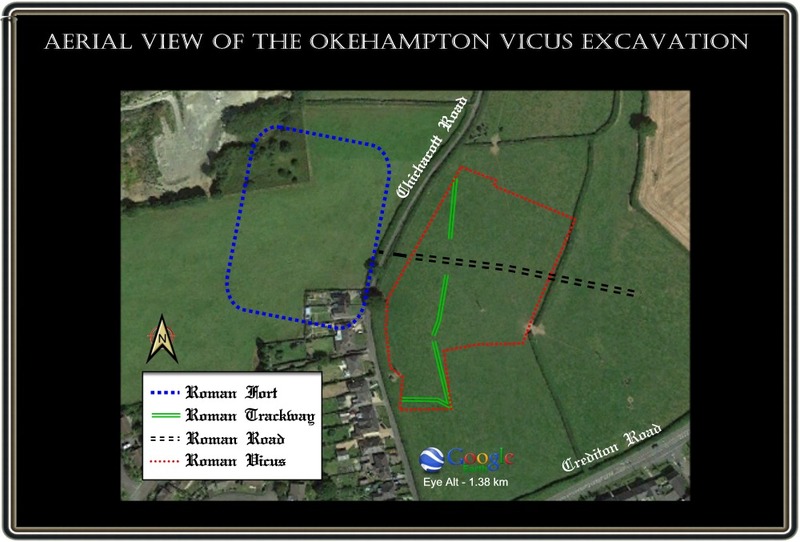 During 1976 and 1977 excavations took place on a Roman fort just to the NNE of Okehampton town, details of which can be found – Here. It has been estimated that it dates back to the 1st century AD. 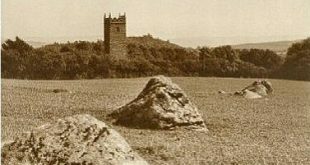 There have been numerous debates as to what the Romans were doing on the northern fringes of Dartmoor. One being that they were there to exploit the tin lodes on and around the area. So, you have a fort that was occupied by a number of soldiers located at where they may have considered to be the back end of nowhere. Clearly they would have needed feeding and no doubt a whole range of other requirements. Imagine then that you were a local inhabitant and were capable of servicing their needs. Surely the logical thing to do would be catering for those requirements. Where better to locate your services than just outside the walls of the fort – close to your market. Such settlements have become known as Vicus which basically describes an extramural settlement outside a Roman fort. Back in the dry year of 1984 sections of a Roman road was spotted on an archaeological aerial survey running in an easterly direction from the fort. The land of which the road was discovered then became part of a proposed development site for houses and a school on the appropriately named ‘Romansfield’ site. Any such project nearly always requires an archaeological survey which the leads on to an excavation project which took place in 2018. This was carried out by AC archaeology who discovered the remains of at least 25 timber buildings which lined both sides of the Roman road. During the excavation remains of bread ovens and a number of amphorae which had been imported from the Mediterranean. This important site is deemed to be the most south westerly discovery of a vicus in the United Kingdom. Bill Horner, Devon County archaeologist working with West Devon District Council to advise on the scheme, said: “The excavation at Okehampton gives us a rare insight into the process of conquest and into the military and associated civilian community that made Britain part of the Roman Empire.” It has been muted that the settlement was abandoned around AD 75. Possibly this was because the Roman contingent had finished their duties or were needed elsewhere? Either way like today when military establishments leave their bases it must have had a dramatic effect on the locals and their economy. Excavation work on the project is still continuing with the hopes of further finds. When this stage is complete archaeological research and artefact study will be carried out thus ending in a detailed report. Once complete the assemblage of finds will be displayed at the Plymouth Museum and Art Gallery. The site developers have also committed themselves to reconstructing part of the Roman road and erecting interpretation signs at the new school. This whole process could take many months but in the meantime a new exhibition at the Okehampton Museum of Dartmoor Life will be opening on the 25th of March 2019. Called ‘Life at the Edge of the Empire’ which tells the story of Roman Okehampton.